Halloween is quickly nearing, which means my favorite way to spend my free time is to enjoy the holiday to its fullest potential. For me, that means visiting haunted houses and attractions. Our family absolutely loves going on haunted hayrides or houses. They are really so much fun. This past weekend, we were invited* to visit our favorite attraction out there–Terror Behind The Walls, the haunted house located inside Eastern State Penitentiary. This isn’t really a haunted house, but rumor has it that it actually is a haunted prison. Abandoned long ago, this building stands ominous and dark, with sinister shadows at every turn. Once a magnificent structure that housed infamous criminals, including the likes of Al Capone, Eastern State Penitentiary was a model for the world. The blueprint for the building is like a wheel with spokes, different hallways leading in different directions with an outer wall encompassing it. Once the prisoners sat in confinement day in and day out and in later years, the prison became the setting for escapes, riots and gruesome murders. Although the prisoners have long since gone, many say there are otherworldly inhabitants still there occupying the small cramped cells. In fact, many paranormal investigations have taken place here resulting in some pretty compelling evidence to support that theory. Upon arrival at the penitentiary, you are immediately greeted by a large hovering gargoyle over the entrance. The tall walls are not welcoming and you find yourself wondering why you were crazy enough to take on the challenge of going through this kind of “entertainment.” There is a feeling that pervades the air and you couldn’t pick a more appropriate setting for a spooky attraction. Once you walk within the walls, you are sent to a holding area where you are given instructions and the option to select which type of experience you would like to have. Glow in the dark necklaces are given to participants who want the more intense version of the show. This allows those working the attraction to know that you are ok with being touched. By picking this option, you could possibly be separated from your group and placed in a prison cell! If you choose not to have anyone touch you at all, that is more than ok, just don’t select a necklace and they will know. Also, if at anytime you decide after putting the necklace on that you no longer want anyone to touch you, just take it off and throw it to the ground. One of the people in my group chose to do that and the performers were extremely respectful of that. However, I chose to wear the necklace. Terror Behind the Walls is set up in six different sections of the prison. You are guided with dividers and clearly marked signage to know where to go, so you can’t get lost. Walking through the abandoned and dilapidated hallways, looking through desolate cells, observing paint peeling from the walls, and the palpable heavy feeling in the air makes for an incredibly creepy experience in and of itself. Add to that strobe lights, fog, and Hollywood worthy make up and costumes and you have one freaky night! Each area that we went through was incredible! Each section was unique and had scary and exciting elements within. I particularly loved the 3D section as it added many optical illusions to the already heightened sensations we were experiencing. Wearing the necklace definitely added to the thrill of the night, as there were many times throughout our tour where we were touched or taken into a different section. I did find it cool that there weren’t too many decorations needed for the prison, as the ambiance was already there. It wasn’t too bloody or vulgar, as one might think. Actually, it was a major psychological thrill. It was so much fun! If you have brave kids, like mine, this is the ultimate haunted attraction. In fact, my nephew joined us the night we went and this was his very first haunted house. I guess “go big or go home” is the attitude there because he picked quite the venue to experience his very first haunted house! There were actually many kids there the night we went to visit (but they were prepped for the fact that this is a scary place!) For those that want to experience the fun, with a little bit of a less aggressive take, they even have family nights on Sunday nights that allow children ages 7-12 to go through before 7:30pm. It is the same show, just everyone knows to be on the lookout for younger children. You should note that no kids under the age of 7 are allowed at the venue. We love Terror Behind the Walls so much, that we’ve been coming back for several years. We’ve also loved introducing lots of friends and family to the greatest haunted house (prison) I have ever been to. I wish I could have taken pictures or a video to take you with me to show you just how incredible it was. But, alas, that is something you will have to find out for yourself! 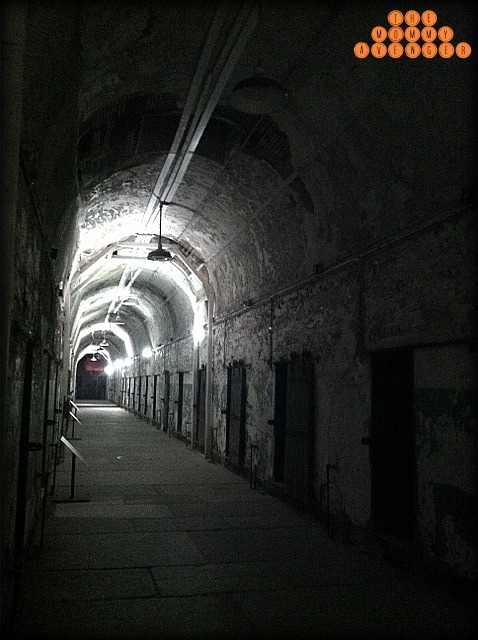 If you dare to brave the Terror Behind the Walls of the Eastern State Penitentiary, you too will find it is one of the coolest Halloween experiences you can possibly have. * we were invited to come experience Terror Behind the Walls to facilitate a review. All opinions are my own.